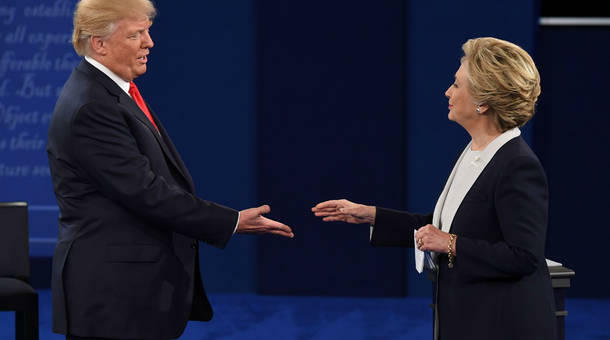 Presidential candidates Hillary Clinton and Donald Trump prepare to shake hands after the second presidential debate at Washington University in St. Louis, Missouri on Sunday. At Schlafly’s Bottleworks in a suburb of St. Louis, a mostly pro-Clinton crowd packed two bar rooms to watch the debate on Sunday night. It was mostly a Clinton crowd, and Clinton supporter Mary DeLeonardis said she wanted to hear the candidates discuss the economy. "Well, I’m interested in what [Clinton] is saying about growing jobs," she said. "What is her plan? I understand the ideas that are out there, but how are we really going to get jobs? What are we going to do about the minimum wage? I'd like to hear her talk about that." The second presidential debate only briefly touched on those issues, with much of the focus on the political fallout of a leaked tape featuring Donald Trump making lewd comments about women. Trump supporter Steve Ogden, a firefighter in St. Louis, said the debate wasn't going to change anyone's minds about the candidates. "The people that want to vote for Hillary are going to vote for Hillary. The people that want to vote for Donald are going to vote for Donald," he said. "What the Trump campaign has done and what the Hillary campaign has done, all this stuff is nothing but redirect... None of them are talking about the real things we're concerned about, and that's what breaks my heart." The moderators did get to Trump’s tax issues, and he admitted he has been taking a roughly billion-dollar write off for his federal taxes. They also brought up the recent Wikileaks dump which includes what the group says are excerpts from Clinton Wall Street Speeches. Cole Pierie, a student and restaurant server who was watching the debate, said he feels Clinton is corrupt, and originally planned to vote for Trump. "I was very intrigued by him at the beginning of the process," said Pierie, "because I thought it would be good to have an outsider that didn't have the political influence, the political money. But then, everything he's said, everything he's done, has made me just hate him." And Trump is steadily losing even more favor with Republicans; there are several calls for the Republican National Committee to pull joint funding from his campaign.